Wedding vows or post wedding woes! 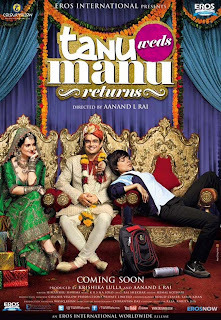 Tanu Weds Manu Returns is everything which Tanu Weds Manu was not. TWM was a light hearted romantic comedy about friendship, festive wedding atmosphere and Kanpuriya Style. TWM made you laugh with the antics of Pappiji (Deepak Dobriyal) and one liners of Raja Awasthi (Jimmy Shergill). TWMR will make your heart melt for various characters in different situations. TWMR is an emotional family drama which deals with the stress in the relationship between Tanu and Manu. This stress isn't affecting just 2 lives but 10 other lives associated with these two characters, like a chain reaction or dominos effect. TWMR is not an outstanding film like its prequel which immortalized various characters in memory of audience. But, it is still an above average film which one should watch. Personally, I was disappointed because I was expecting to watch same chemistry of romantic comedy. Did the director surprise me? Of course, he did but I was more shocked than surprised. Coming to the acting department, Kangana Ranaut leaves you spellbound with the character of Kusum "Datto". There is a stark contrast between Tanu and Datto and yet Kangana graciously exhibited both roles with panache. Be it the look, haryanvi accent or mannerism of characters, Kangana leaves no stone unturned. Especially, the scene where Datto gives her introduction to Manu would make you stand up and clap for her. Madhavan has done the role of "Big Loser" multiple times and no one else could've looked so helpless and pitiful. Suits his image, which he did effortlessly. Deepak Dobriyal, Zeeshan Ayub, Swara Bhaskar, Jimmy Shergill are all class actors and have done wonders on silver screen. But, in TWMR their roles are limited to just being "Shaadi ke Baraati". They just have to be around Tanu and Manu to support them. Rajesh Sharma as Datto's brother is the dark horse in this film and one of his monologue in his village is worth mentioning. Plot of the film is indeed unusual and kudos to Himanshu Sharma for the story. But, I didn't like the ending of the film. Story is going in a direction, then sudden jerk and situation changes and the end. Funny it might sound, but that's like high school mathematics problem of deriving a theorem. Wherever you're stuck, it is LHS = RHS, hence proved! Krsna Solo & Tanishk-Vayu have given a melodious music with a good variety. Banno is already a chart buster and you can't stop dancing to it. Move on and Mat ja re has a melancholic touch. Old School girl is extremely funny and reminds me of "Moora" song of GOW 2. Ghani Bawri was a nicely timed situational song. Otherwise, peppy but it brings a lump in the throat. Verdict: An above average film that can be watched with family. Just be clear that it isn't a romantic comedy but an emotional family drama. Else, you might be a bit disappointed like me.